Saudi-based Almarai owns 15,000 acres of an irrigated valley – but what business does a foreign food production company have drawing resources from a US desert? Four hours east of Los Angeles, in a drought-stricken area of a drought-afflicted state, is a small town called Blythe where alfalfa is king. More than half of the town’s 94,000 acres are bushy blue-green fields growing the crop. Massive industrial storehouses line the southern end of town, packed with thousands upon thousands of stacks of alfalfa bales ready to be fed to dairy cows – but not cows in California’s Central Valley or Montana’s rangelands. Instead, the alfalfa will be fed to cows in Saudi Arabia. The storehouses belong to Fondomonte Farms, a subsidiary of the Saudi Arabia-based company Almarai – one of the largest food production companies in the world. The company sells milk, powdered milk and packaged items such as croissants, strudels and cupcakes in supermarkets and corner stores throughout the Middle East and North Africa, and in specialty grocers throughout the US. Each month, Fondomonte Farms loads the alfalfa on to hulking metal shipping containers destined to arrive 24 days later at a massive port stationed on the Red Sea, just outside King Abdullah City in Saudi Arabia. With the Saudi Arabian landscape there being mostly desert and alfalfa being a water-intensive crop, growing it there has always been expensive and draining on scarce water resources, to the point that the Saudi government finally outlawed the practice in 2016. In the wake of the ban, Almarai decided to purchase land wherever it is cheap and has favorable water conditions to produce enough feed for its 93,000 cows. In 2012, they acquired 30,000 acres of land in Argentina, and in 2014, they bought their first swath of land in Arizona. Then, in 2015, they bought 1,700 acres in Blythe – a vast, loamy, agricultural metropolis abutting the Colorado river, where everything but the alfalfa seems cast in the hue of sand. Four years later, the company owns 15,000 acres – 16% of the entire irrigated valley. But what business does a foreign company have drawing precious resources from a US desert to offset a lack of resources halfway around the globe? What Fondomonte Farms is doing is merely a chapter in the long story of water management in the west, one that pierces the veil on the inanities of the global supply chain – how easy it is to move a commodity like alfalfa, or for that matter lettuce or clementines or iPhones, across more than 13,000 miles of land and sea, how much we rely on these crisscrossing supply lines, and at what cost to our own natural resources. Though Blythe is a desert, it is adjacent to the lower Colorado river, a river that supplies water to roughly 40 million people and irrigates 4m acres of land. Bart Miller, Western Resource Advocates’ healthy rivers program director, says that over the last 80 years, due to the growth of proximate cities such as Denver, Los Angeles and Phoenix and the expansion of large-scale farms, demands on the river have steadily climbed. The river is also shrinking due to climate change. It has endured a nearly two-decade-long drought, with only waning rain and snowpacks to supply its flow. As a result, the river is at a record low. The state of the Colorado river can be traced, in part, to a water claim approved by the federal government all the way back in the 1800s when a British gold rush-era prospector named Thomas Blythe first laid eyes on the desert expanse adjacent to the rushing Colorado river and submitted a water claim application to the federal government. That 1877 water claim, now owned by the Palo Verde Irrigation District, ensures that Blythe has “unquantified water rights for beneficial use”; in other words, as much water as those living and farming within the district could possibly need in this water-scarce region, and for free. The Palo Verde Irrigation District is not allowed to sell the water – not to the company Calistoga, say, for bottled water, but not to their farmers, either. Blythe farmers are thus only charged to cover the water district’s overhead – $77 an acre a year, an astonishingly low rate. In other places, people are charged according to how much water they use and are thus incentivized to use less. In Blythe, no matter how much he uses, a farmer gets his water for a cheap, flat rate. It’s no surprise, then, that Fondomonte chose to set up shop here. While Saudi Arabia has enacted laws to manage their water resources, in the US we are still governing our water based on compacts made in the 1800s – before the western cities had boomed, before suburban sprawl, before factory farming and a global supply chain and, of course, before climate change. Water from the Colorado might be limited, but in Blythe, while they still have it, it’s there for the taking. Getting the water from the river to Blythe is a complicated engineering feat. “It’s a really unique system,” explains JR Echard, assistant manager of the Palo Verde Irrigation District, as he traces how the water moves throughout the valley on a map on his office wall. “We’re in the desert,” Echard said, “but we live next to a massive river and have rights to it.” Thomas Blythe might have appeared crazy to want to build an empire of agriculture out here in the desert but, in Echard’s eyes, Blythe was on to something. The Colorado river powers a meticulously managed system of canals and dams. Southern water districts like Palo Verde estimate their constituents’ water needs and submit corresponding orders to the Parker and Hoover dams upstream which then release the requested water as though turning a great industrial tap. Once in Blythe, the diverted water moves downward into the valley below with the help of gravity and into a 250-mile system of canals that wind through 100,000 acres of cropland. The canals are outfitted with electronic gates that can be opened and closed with the click of a mouse from the Palo Verde Irrigation District’s offices. In California, everyone’s after whatever water they can get. Because of the low supply, the Palo Verde Irrigation District is currently three years into a 30-year fallowing contract – when farmers are paid not to plant a portion of their fields so the water can instead be sent to cities – with the Metropolitan Water District, which supplies water to big cities like San Diego and Los Angeles. Fondomonte inherited a fallowing contract, so they are restricted from planting a portion of their land each year. This drives the company mad, an employee whom I will call Jim, told me. He asked not to be named for fear of reprisal from Fondomonte. Alfalfa-hungry Fondomonte would prefer to plant every inch. Fondomonte, on the other hand, has been a boon. “Everyone wants to be working here,” Jim told me. Not only does the company employ more than 100 locals full-time – as compared with the part-time or seasonal labor found on most farms – and with 401ks, vacation and health insurance, but they also support local farmers by purchasing their alfalfa to add to their bales and ship overseas. But is it an outrage? The thing about alfalfa is that it’s perennial; you can grow it all year and stagger the planting in the fields so that there’s nearly always a new crop of alfalfa ready to be cut as well as planted. Once it’s cut, it keeps growing, and they cut it again. A crop can last up to five years, but Fondomonte generally rips up and replants after two or three; any longer than that and the alfalfa grows more stem-heavy, and thus drops in quality. Each day on their massive, gated farm headquarters, Fondomonte employees take samples of the alfalfa and test its quality: the higher the ratio of leaves to stems, the better the quality, and thus the better the milk the cows will produce. “Almarai only wants the highest quality,” Jim explained. He broke open a bale with his hands as if tearing off a piece of bread. The outside of the alfalfa was brown, but just inside, was a vivid and surprising green. Fondomonte employs some of the most hi-tech mechanisms big ag has to offer – computer programs that combine with satellite and drone imagery to delineate the soil characteristics of each speck of land, drones take videos of production in progress, and the company is currently improving their own system of intra-farm canals and electronic gates so that they can irrigate each field with the touch of a button from behind a computer screen in the office. It’s all part of their ongoing effort to maximize their efficiency and crop quality, thus their profit, thus their empire in Saudi Arabia – perhaps, eventually, here as well. “If it’s raining,” the employee told me, the farm manager “can just farm from behind his desk”. They are entirely self-sufficient, and have expertise in constructing a hi-tech alfalfa empire having already done it in Saudi Arabia. Dan Putnam, an alfalfa expert and UC Davis professor, explained US-grown alfalfa has long been shipped overseas, long before Almarai. Alfalfa is the third largest economic product in the US, but only 4% is exported annually. In the western states, however, which are high producers close to shipping ports to major export markets like China, Saudi Arabia and Japan, about 15% is exported each year. These high-export states are also the states that happen to be grappling with drought, meaning that the most water-strapped states are shipping much of their water overseas, in the form of alfalfa. When Almarai first began purchasing land in the western US, environmentalists, and many average citizens, were outraged. “Saudi Hay Farm in Arizona Tests State’s Supply of Groundwater,” said an NPR article in November of 2015. “Saudi Arabia is Outsourcing its Drought to California,” wrote Gizmodo. Yet Putnam takes umbrage with the outrage over alfalfa exports. Why, he wonders, are people so much more outraged over alfalfa using water here only to be shipped overseas, what about almonds, a water intensive crop of which 70% of California’s harvest is shipped overseas. Or oranges? Or lettuce? I suggested to him that it might have something to do with the fact that alfalfa isn’t seen as food – it’s just a plant, a mega-crop divorced, in common perception, from its value as food. But as the basic element of a larger food chain of the dairy and meat industry, alfalfa, Putnam claims, is critical. Putnam, along with many farmers I spoke to, urges people to consider how much water crisscrosses the globe in the current supply chain. It’s not just alfalfa, and it’s not just agriculture. People will find goods at the cheapest prices, and companies in areas with unstable resources will relocate elsewhere. On our way back from the dam to the district offices, Echard drove me up along the access roads to get a panorama of the canals, and past some bright fields of alfalfa. We then drove to a part of valley where, in partnership with various environmental organizations, the Palo Verde Irrigation District had planted a large grove of trees to revive some of the habitat that once stretched so abundantly along this part of the Colorado. In August, he told me, it can be 115F (46C) outside, but under this canopy of trees, it might be 20 degrees cooler. “Here in the middle of the desert, we’ve got a little forest,” he said, proudly. Like the river, this forest, too, is a manmade environment; man’s footprint is everywhere. As we drove back to the office, I pointed out some nice bushy trees along the canal. “Oh, those are saltcedar,” Echard said. An invasive species from Asia that drain the water table and leave salt deposits in the soil, which destroys the other plants. “No one wants it,” he said, as he yanked the truck into gear and headed back out again amid the bright carpets of alfalfa stretching in all directions. Dubai (CNN Business)Uber is buying the biggest ride-hailing app in the Middle East. In the biggest tech deal the region has ever seen, Uber is paying $3.1 billion for Careem with a mixture of cash and securities that will convert into Uber shares when the company goes public. Careem, based in Dubai, was founded in 2012 and has since become the regional market leader with 30 million users across 90 cities in the Middle East, North Africa and Pakistan. It was valued at more than $2 billion in a funding round in October. Careem will operate under its own brand as a subsidiary of Uber and continue to be led by CEO Mudassir Sheikha, the companies said in a statement Tuesday. In an email to Uber staff members seen by CNN Business, CEO Dara Khosrowshahi said keeping the Careem brand and operations "has the advantage of letting us build new products and try new ideas across not one, but two, strong brands." Uber is gearing up for an initial public offering that's expected to take place later this year. It's reportedly seeking a valuation of as much as $120 billion. Combining with Careem will give Uber dominance over the Middle East region and could help the US company trim its losses. Uber has a mixed track record in international markets. Since 2016, it has retreated from China, Russia and eight Southeast Asian countries. But it has been playing up its global ambitions as it prepares to go public. Uber CFO Nelson Chai said in November that the company had invested in "high-potential markets in India and the Middle East where we continue to solidify our leadership position." In India, Uber competes with homegrown startup Ola, which operates in more Indian cities than its US rival. Careem has used home field advantage and local knowledge to make life difficult for Uber since the American company entered the Middle East market in 2013. Careem's biggest investors include Rakuten (RKUNF), Didi Chuxing, Daimler (DDAIF) and the Saudi government, which has also poured billions into Uber. This is the second takeover of a Dubai unicorn after Amazon (AMZN) bought e-commerce startup Souq in 2017. The United Arab Emirates is pushing to become a regional tech hub but is yet to produce a third unicorn after Souq and Careem. High license costs and a lack of funding have often deterred entrepreneurs. Abu Dhabi is trying change that and this week launched a new tech hub with incentives such as free housing and health care. The acquisition of Careem is pending regulatory approval and is expected to conclude in the first quarter of 2020. CARACAS, Venezuela (AP) — A new power outage spread across much of Venezuela on Monday, knocking communications offline and stirring fears of a repeat of the chaos almost two weeks ago during the nation’s largest-ever blackout. The outage began shortly after 1 p.m. (1700 GMT) and appeared to have affected as many as 16 of Venezuela’s 23 states, according to reports on social media. Officials declared that power had been fully restored by early evening, but hours later the lights went out again in much of the country. As with the previous outage, the government of President Nicolas Maduro sought to blame U.S.-backed opponents, accusing them of sabotaging the Guri dam, source of the bulk of Venezuela’s electricity. Officials said the “attack” had been controlled, but their assurances, similar to ones the last time around, did little to calm the anger of residents in Caracas who filled traffic-clogged streets as they walked home after subway service in the capital was suspended. Their patience grew increasingly thin when a second outage struck late into the night, leaving neighborhoods pitch black. On social media, Venezuelans reported outages in Caracas and much of western Venezuela. Some said residents were banging pots and pans in the darkness in a sign of the nation’s mounting tensions. The latest outages come as President Nicolas Maduro tries to keep his grip on power amid a revived opposition movement and punishing economic sanctions from the United States. “This outage is evidence that the dictator is incapable of resolving the crisis,” Guaido wrote on Twitter Monday. Lavrov countered during the call that “Washington’s attempts to organize a coup in Venezuela and the threats directed against its legitimate government represent a violation of the U.N Charter and blunt interference into internal affairs of a sovereign nation,” according to the Russian foreign ministry. The U.S. and dozens of other countries support Guaido, who says Maduro’s re-election last year was rigged. Maduro alleges the U.S. and Guaido are plotting a coup. Comcast Spectacor, which owns the Flyers, is to announce Monday morning that it will construct the first arena for gaming fans in the U.S. for the Comcast-owned Fusion, company officials say. The $50 million project is a testament to the surging popularity of esports, in which players compete in video games before large crowds. The company plans to break ground this summer on part of the 47-acre stadium complex site that Comcast Spectacor leases in South Philadelphia. 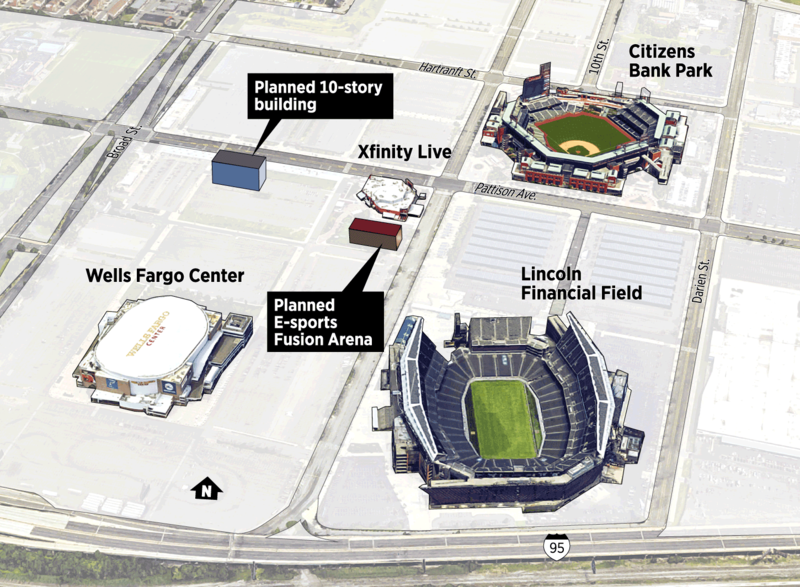 The 3,500-seat arena will rise on a parking lot, next to Xfinity Live! and within walking distance of the Linc, Citizens Bank Park, and the Wells Fargo Center. Besides housing Comcast’s Fusion, one of the Overwatch League’s teams, the venue is planned to be a major east coast hub for gaming events, company executives said. The arena will mark the third major project that Comcast Spectacor is now undertaking on the site. It is renovating the Wells Fargo Center for $250 million and seeking tenants for a 10-story office tower, costing $80 million, also near Xfinity Live. The price tag for the three projects, including the new arena, is $380 million. The company may add yet more development on the site, say those with knowledge of the company’s thinking. 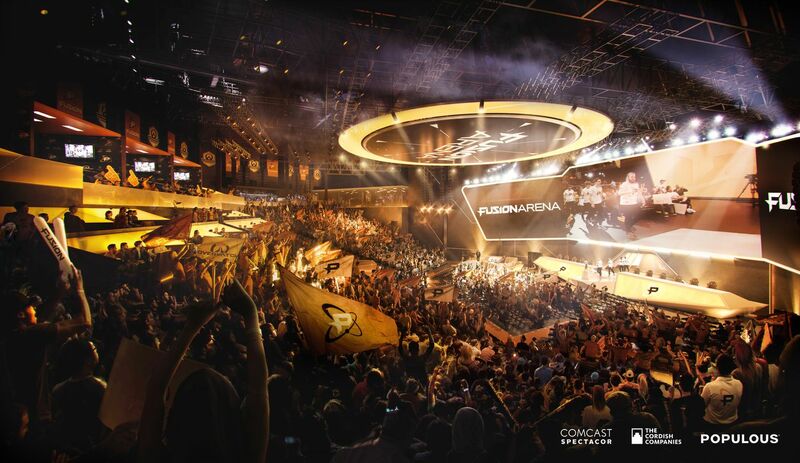 Comcast Spectacor and Cordish Cos. revealed plans for a new 3,500-seat esports stadium adjacent to the Xfinity Live complex in South Philadelphia. The facility would house Comcast's esports team, the Fusion, and would also host other events. Also planned nearby would be a 10-story office building. Esports, or watching highly skilled gamers compete with each other for titles or prize money, has soared in popularity globally, particularly in Asia but also in the U.S. The Overwatch League replicates the legacy professional sports model with 20 city-based franchises in China, South Korea, Canada, France, England and the U.S. catering to local fans. Overwatch League competitions -- with six gamers battling six others in a survival game -- are viewed over the Twitch streaming service and televised on ABC and ESPN. Activision Blizzard, which owns the Overwatch game, says that 40 million people play globally, including 400,000 in the Philadelphia television market ranging from Delaware and the Jersey Shore to Harrisburg. Fusion itself has almost 100,000 Twitter followers and one of its popular players, Gael Gouzerch, or @poko, boasts 40,600. Esports no longer carries “the stigma of you in your basement,” said Phil Weinberg, general counsel at Comcast Spectacor. Tucker Roberts, the son of Comcast chief executive Brian Roberts, is president of Spectacor Gaming and the Fusion. Comcast Spectacor expects to hold about 120 events a year in the new arena, with other gigs ranging from TED Talks to electronic dance music and K-pop concerts. K-pop is a music genre from South Korea that is popular with Fusion fans, Comcast Spectacor officials said. The Fusion Arena is looking to sell naming rights to the venue. Populous, the Kansas City sports- and entertainment-architecture firm, is designing the Fusion Arena. The firm also designed the new Yankees stadium, the T-Mobile Arena in Las Vegas, and the London Olympics main stadium. Populous recently re-purposed a convention center in Arlington, Texas, for esports. “The way we have designed the spectator bowl [inside the arena] optimizes the viewer experience,” Brian Mirakian, Populous senior principal, said last week. Like other teams in the Overwatch League, the Fusion are playing this year at Johnny Carson’s former studio in Burbank, Calif., now called Blizzard Arena. 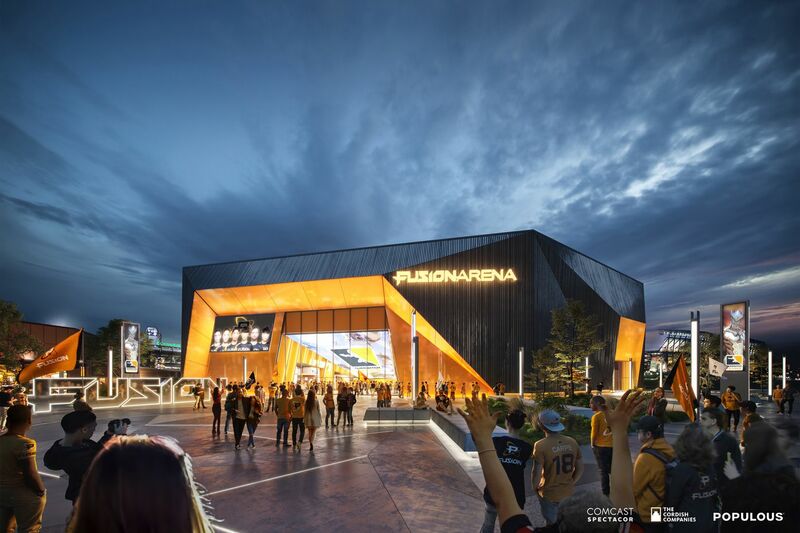 Ticket prices for the Fusion Arena have not been determined, officials said. About 15 percent of the Fusion Arena has been designed with premium-priced luxury seating and suites, said Dave Scott, Comcast Spectacor CEO. Next year, the Fusion team will relocate from California to Philadelphia, and compete in temporary venues for a year. Those locations could be the 2300 Arena in South Philadelphia and Boardwalk Hall in Atlantic City. The Fusion Arena is expected to open in early 2021. The Overwatch League regular season began in February and extends through August, with playoffs and championship games in September. The Fusion on Friday were in third place, with a 5-2 record. The new Fusion Arena fits into the 47-acre site’s master development plan, which dates to the 1990s. Comcast Spectacor officials say they have informed city officials of the arena construction. The arena will be built on a parking lot south of Xfinity Live! and the office building will rise on a parking lot west of Xfinity Live! According to the master plan, the South Philadelphia sports complex -- which includes the Linc and the Citizens Bank Park -- has to maintain 18,000 parking spaces. Comcast Spectacor says the complex will continue to meet that requirement. Elon Musk, co-founder and chief executive officer of Tesla Inc., speaks at an unveiling event for The Boring Company Hawthorne test tunnel December 18, 2018, in Hawthorne, Calif. The tunnel is a preview of Musk's larger vision to ease traffic in Los Angeles. Virginia transit officials flew out to California earlier this year to check out a tunnel dug by Elon Musk’s Boring Company and, well, they think the state should stick with traditional railways and roads for now. “It’s a car in a very small tunnel,” Michael McLaughlin, Virginia’s chief of rail transportation, told members of the Commonwealth Transportation Board’s public transit subcommittee on Wednesday. The board has been discussing high-dollar investments in the state’s rail infrastructure, including a $1.3 billion bridge between Virginia and Washington. But board members say those conversations have been clouded by questions about whether such upgrades might be rendered obsolete before they’re even completed if Musk’s much-hyped tunneling and hyperloop technology advances beyond its current experimental stage. Musk, the billionaire CEO of Tesla and SpaceX with a mixed record for delivering on crazy-sounding ideas, announced the Boring Company in a series of tweets while he was stuck in traffic. Tunneling isn’t a new technology. The innovation Musk hopes to bring to it is a drastic reduction in costs. And on that front, he claims he’s been successful, saying the project cost about $10 million. That’s significantly less than the $170 million to $920 million per mile cost of recent subway projects around the country, according to CityLab, which notes Musk’s figure doesn’t include research, development, equipment and, possibly, labor. The officials from Virginia who met with company leaders and took a drive through the tunnel in January say nothing they saw would lead them to change their approach to transit in the near term. “I think there’s a lot of show going on here,” said Scott Kasprowicz, a Commonwealth Transportation Board member who made the trip with McLaughlin and public transit chief Jennifer Mitchell. “I don’t mean to suggest that they don’t have a serious plan in mind, but I don’t consider the steps they’ve taken to date to be substantive. They’ve purchased a used boring machine. They’ve put a bore in the neighborhood where they developed the SpaceX product, and they’ve taken a Model 3 and put guidewheels on it and they’re running it through the tunnel at 60 miles per hour. Kasprowicz said he understands the company gained information in their first phase that will guide future projects, but he said he still views the work as decades away from delivering usable, meaningful new transit options. From his perspective, that will change when either the Boring Company or the hyperloop technology it might one day carry begin to attract significant outside investment needed to move major infrastructure projects forward. At this point, Kasprowicz noted, Musk is the only major investor in the Boring Company. None of this is to say the project might not one day hold promise. He said that aside from cost, environmental impacts are the greatest impediments to major transit projects. Moving them underground would virtually eliminate those land use concerns. “The reality is it’s a great idea, but I’m not sure its time has come,” he said. McLaughlin, the state’s head of rail, seemed to concur. After outlining all the issues he saw with the project, he noted the company was aware of the hurdles and working to solve them. CHARLESTON, MS (WLBT) - Morgan Freeman has converted his 124-acre Charleston, MS ranch into a honeybee sanctuary, reports Forbes. Freeman obtained the bees from Arkadelphia, Arkansas and even said that he doesn't use a bee suit while feeding the insects. The 81-year-old actor, known for his roles in Christopher Nolan's Batman trilogy and for playing God in Bruce Almighty, discussed his foray into beekeeping in an appearance on Jimmy Fallon in 2014. "There's been a frightening loss of bee colonies, particularly in this county," Freeman said in a separate interview with Larry King. "To such an extent that the scientists are now saying 'this is dangerous.'" A study by the University of Vermont found that wild bee populations in the United States have declined by 23 percent from 2008 and 2013. Freeman was sent to live with his grandmother in Charleston as an infant, and purchased the family land from his parents in 1991. He also owns Ground Zero Blues Club in Clarksdale. The denial of climate change is not just ignorant, but “malign and evil”, according to Mary Robinson, because it denies the human rights of the most vulnerable people on the planet. The former UN high commissioner for human rights and special envoy for climate change also says fossil fuel companies have lost their social licence to explore for more coal, oil and gas and must switch to become part of the transition to clean energy. Robinson will make the outspoken attack on Tuesday, in a speech to the Royal Botanical Gardens at Kew in London, which has awarded her the Kew International Medal for her “integral work on climate justice”. She also told the Guardian she supports climate protests, including the school strikes for climate founded by “superstar” Greta Thunberg, and that “there is room for civil disobedience as a way of communicating, though we also need hope”. “The evidence about the effects of climate change is incontrovertible, and the moral case for urgent action indisputable,” she will say. She also attacks big oil, gas and coal companies in her speech. She is expected to say: “We have entered a new reality where fossil fuel companies have lost their legitimacy and social licence to operate.” She says exploration for new reserves must end, given that most of existing reserves must be kept in the ground if global warming is to be tackled. The US president, Donald Trump, is also criticised by Robinson for his “egregious act of climate irresponsibility” in withdrawing from the Paris climate agreement. “Bad leadership has consequences now that are really bad for the people in the poorest communities, including in the US,” she told the Guardian. There have been several strong attacks on climate change denial in recent months, with critics saying that proposals in the US for a new national security council panel of climate change deniers are “Stalinist”. At least some people are starting to get the message. IHMO it's just to little and about 50 years too late. A county in New York state has declared a state of emergency following a severe outbreak of measles. Rockland County, on the Hudson river north of New York City, has barred unvaccinated children from public spaces after 153 cases were confirmed. Violating the order will be punishable by a fine of $500 (£378) and up to six months in prison. The announcement follows other outbreaks of the disease in Washington, California, Texas and Illinois. Vaccination rates have dropped steadily in the US with many parents objecting for philosophical or religious reasons, or because they believe misleading information that vaccines cause autism in children. "We will not sit idly by while children in our community are at risk," Rockland County Executive Ed Day said. "This is a public health crisis and it is time to sound the alarm." Why has this county taken action? The outbreak in Rockland County is largely concentrated in the ultra-Orthodox Jewish community, the New York Times reported. It is believed it could have spread from other predominantly ultra-Orthodox areas around New York which have already seen outbreaks of measles. Mr Day said health inspectors had encountered "resistance" from some local residents, which he branded "unacceptable and irresponsible". "They've been told 'We're not discussing this, do not come back' when visiting the homes of infected individuals as part of their investigations," he said. Dylan Skriloff, the editor of local newspaper the Rockland County Times, told the BBC the number of measles cases in the county had been increasing steadily in recent weeks. "The first reports came six months ago, and each week we've had a new report with increased numbers," he said. "It's become clear that it's not abating, and the authorities... don't want to accept [this reality] as the new normal." Skriloff said that the authorities had been making "steady progress" in encouraging religious communities to immunise children but communication had broken down in the last month. "The rate of immunisation in the religious communities, for young people, it's about 50%-60%, which is not nearly enough." Officials said the order, which bans anyone under the age of 18 who has not been vaccinated from places such as schools, shopping centres, restaurants and places of worship, would come into effect at midnight on Wednesday and last 30 days. Rockland County has a population of more than 300,000. Why are there so many outbreaks? Both Europe and the US are dealing with outbreaks of measles, but why now? Nothing has changed about the virus; the answer instead lies in human behaviour. Myths about the vaccine causing autism have been debunked but are still affecting the number of children being immunised. And complacency from a generation of parents unfamiliar with the dangers of measles has also had an effect. So with every year that goes by, the total number of unvaccinated people grows, often in pockets in some communities. It is like an ever-growing tinderbox just waiting for a spark. Measles still runs rampant in many parts of the world - it kills around 90,000 people a year. All it takes is a bit of travel for measles to reach those vulnerable pockets and spread like wildfire. What has happened elsewhere with measles vaccinations? Measles is a highly infectious disease and can cause serious health complications, including damage to the lungs and brain. But despite the dangers, vaccination rates are declining in many countries. In the UK, the government is seeking new legislation to force social media companies to remove content promoting false information about vaccines. There were more than 82,500 cases in Europe in 2018 - the highest number in a decade and three times the total reported in 2017. The World Health Organization has declared the anti-vaccine movement to be one of the top global health threats for 2019. VIENNA (Reuters) - Austrian Chancellor Sebastian Kurz on Wednesday said there was a financial link between the man who killed 50 people in mass shootings at mosques in Christchurch, New Zealand, and the far-right Identitarian Movement in Austria. Hansjoerg Bacher, spokesman for prosecutors in Graz, said Martin Sellner, head of the Identitarian Movement - which says it wants to preserve Europe’s identity - received 1,500 euros ($1,690) in early 2018 from a donor with the same name as the man charged with murder following the Christchurch attack. “We can now confirm that there was financial support and so a link between the New Zealand attacker and the Identitarian Movement in Austria,” Kurz said. Sellner published a video on YouTube in which he said he had received a donation from the man and that police had raided his house over the possible links to the Christchurch attacker. Bacher said an investigation was underway about whether there were criminally relevant links between Sellner and the attacker. The Austrian Interior Ministry declined to comment. Kurz said Austria was looking into dissolving the Identitarian Movement. “Our position on this is very clear, no kind of extremism whatsoever - whether it’s radical Islamists or right-wing extremist fanatics - has any place in our society,” Kurz said. On Tuesday, Kurz said on Twitter any connection between the Christchurch attacker and members of the Identitarian Movement in Austria needed to be fully clarified. Austrian Vice-Chancellor Heinz-Christian Strache, of the far-right Freedom Party (FPO), said the FPO had nothing to do with the Identitarian Movement. From being close to French-Algerian movements at the beginning of his writings in 1970, he moved to attacks on globalisation, unrestricted mass immigration and liberalism as being ultimately fatal to the existence of Europe through their divisiveness and internal faults. His influences include Antonio Gramsci, Ernst Jünger, Jean Baudrillard, Georges Dumézil, Ernest Renan, José Ortega y Gasset, Vilfredo Pareto, Guy Debord, Arnold Gehlen, Stéphane Lupasco, Helmut Schelsky, Konrad Lorenz, the German Conservative Revolutionary movement, the non-conformists of the 1930s, Johann Gottfried Herder, and communitarian philosophers such as Alasdair MacIntyre and Charles Taylor. Benoist is opposed to the American liberal idea of a melting pot. He opposed Jean-Marie Le Pen (even though many people influenced by Benoist support him), racism and antisemitism. He has opposed Arab immigration to France, while supporting ties with Islamic culture. He favors "ethnopluralism", in which organic, ethnic cultures and nations must live and develop independently. He also opposes Christianity as inherently intolerant, theocratic and bent on persecution. He also opposes reconstructivism. De Benoist has made pointed criticism of the United States: He has been quoted as saying "Better to wear the helmet of a Red Army soldier," he wrote in 1982, "than to live on a diet of hamburgers in Brooklyn." In 1991, he complained that European supporters of the first Gulf War were "collaborators of the American order." Benoist opposes political violence, saying he is building "a school of thought, not a political movement." While he has complained that nations like the United States suffer from "homogenization," he has also distanced himself from some of Jean-Marie Le-Pen's views on immigration. Benoist considers himself both left and right-wing, although he is critical of modern liberal-democracy. Benoist is also a proponent of the idea of integral federalism, in which the nation state is surpassed, giving way to regional identities and a common continental one at once. This would be distinct from what he sees as the consumerism and materialism of American society, as well as the bureaucracy and repression of the Soviet Union. New Jersey Gov. Phil Murphy plans to sign legislation allowing terminally ill patients to seek life-ending medication. The New Jersey Senate approved the "Medical Aid in Dying for the Terminally Ill Act" in a 21-16 vote Monday. Gov. Murphy said in a statement that he supports the measure and would sign it into law. “Allowing terminally ill and dying residents the dignity to make end-of-life decisions according to their own consciences is the right thing to do,” Murphy said. Democratic senators Nicholas Scutari, Richard Codey and Senate President Steve Sweeney all sponsored the legislation. "This is a humane and dignified process that respects the free will of terminally ill patients," Senator Scutari (D-Union) said. "We should permit qualified patients to make the decision to end their own lives in a dignified manner. There is no good reason for them to be forced to prolong their pain and suffering or to prolong the grief of their loved ones if they make that choice." For more details on this story visit NBC Philadelphia. 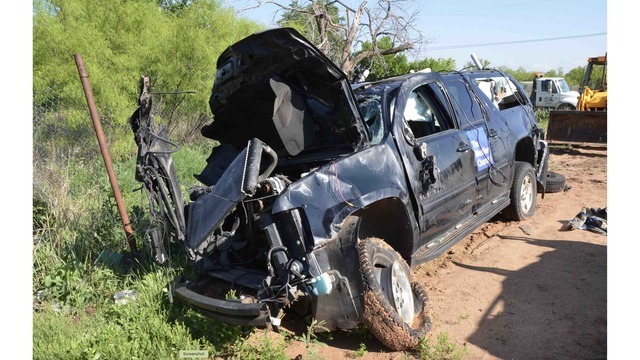 LUBBOCK, Texas - On Tuesday the family of Corbin Lee Jaeger filed a $125 million lawsuit against the Weather Channel (TWC) for a deadly crash near Spur in Dickens County. The crash was in March of 2017. “TWC’s on air personalities Kelley Williamson and Randall Yarnall habitually ran stop signs, traffic lights and violated other basic traffic safety laws, in attempts to obtain video footage for their show,” a statement from the family’s attorneys said. Williamson and Yarnall died in the crash along with Jaeger who was age 25 at the time of his death. Ostensibly, the Weather Channel was interested in a major storm in the area on the day of the crash. “The lawsuit also alleges that TWC was aware of their dangerous, reckless driving habits,” the statement said. “Yarnall and Williamson had a history of reckless driving when storm chasing,” the lawsuit said. The lawsuit said Jaeger had the right of way when the Weather Channel’s storm chasing unit ran a stop sign at 70 miles per hour. The lawsuit said the Weather Channel was well aware of bad driving habits and was grossly negligent in letting it go on. Not only did the Weather Channel not stop the bad driving, the lawsuit said, but benefited from it because it would “increase the sense of danger” for their TV show. EverythingLubbock.com is in the process of reaching out to the Weather Channel to invite comment. CLICK HERE to read a copy of the lawsuit provided by the family’s attorneys. Drivers in Europe will soon have to get used to anti-speeding devices in their cars, after EU legislators agreed this morning on new legislation requiring them. The agreement came after months of often tense negotiations which pitted safety against freedom, and prompted concerns over “big brother” watching driving behavior. The legislation will require all new vehicles put on the market to be equipped with Intelligent Speed Assistance (ISA) technology. The devices can use sign-recognition video cameras or GPS-linked data to automatically limit the speed of a vehicle. They do so by limiting the engine power to prevent the vehicle from accelerating past the limit, rather than by throwing on the brakes. The technology is already fitted in a small number of vehicles on the road, including the new Ford Focus European model. It’s being promoted in Europe by safety organizations such as the European Transport Safety Council – but it has not been embraced in the United States. Many drivers have begun using portable devices which pick up the speed limit data and warn a driver when they are going faster than it allows. The haters inspire the crazies, and the crazies shoot people. Not surprising he sent money to a racist hate organization, but that falls far short of proving any culpability, legally, on their part. I doubt they sent HIM money...because they aren't looking to shoot people, just get money and power from the racism they stir up. In real life, working hard only takes you so far. Those who go all the way — to grand fortune — typically get a substantial head start. So documents a new analysis of the Forbes 400. A variety of commentators have jumped on Romney for that line. They’ve pointed out that Mitt, the son of a wealthy corporate CEO, has enjoyed plenty of privilege, everything from an elite private school education to a rolodex full of rich family friends he could tap to start up his business career. On top of all that, the young Mitt also enjoyed $1 million worth of stock his father threw his way to tide him over until big paydays started arriving. Not quite “nothing.” But no reason to pick on Mitt either. Most really deep pockets, not just Mitt, consider themselves entirely “self-made.” The best evidence of this predilection to claim “self-made” status? The annual September release of the Forbes magazine list of America’s 400 richest. The basic conclusion from these findings: Forbes is spinning “a misleading tale of what it takes to become wealthy in America.” Most of the Forbes 400 have benefited from a level of privilege unknown to the vast majority of Americans. In effect, as commentator Jim Hightower has aptly been noting for years, most of our super rich were born on third base and think they hit a triple. In its just-released new report, United for a Fair Economy extends this baseball analogy to last year’s Forbes 400. UFE defines as “born in the batter’s box” those Forbes 400 rich who hail from poor to middle-class circumstances. Some had nothing growing up. Others had parents who ran small businesses. About 95 percent of Americans, overall, currently live in these “batter’s box” situations. Just over a third, 35 percent, of the Forbes 400 come from these backgrounds. Just over 3 percent of the Forbes 400, the United for a Fair Economy researchers found, have left no good paper trail on their actual economic backgrounds. Of the over 60 percent remaining, all grew up in substantial privilege. Those “born on first base” — in upper-class families, with inheritances up to $1 million — make up 22 percent of the 400. On “second base,” households wealthy enough to run a business big enough to generate inheritances over $1 million, the new UFE study found another 11.5 percent. Last year, a rich American had to be worth at least $1.05 billion to make the Forbes 400. This year’s entry threshold: $1.1 billion, the highest ever. Forbes, the United for a Fair Economy researchers sum up, has glamorized the myth of the “self-made man” and minimized “the many other factors that enable wealth,” most notably the tax breaks and other government policies that help the really rich get ever richer. And many of those who do have that opportunity — like the mega millionaires in Boca Raton who applauded so warmly when Mitt Romney asserted he had “inherited nothing” — see absolutely no reason to turn that coin over.